Heloise at the 2010 Texas Book Festival. Ponce Kiah Marchelle Heloise Cruse Evans  (born April 15, 1951 in Waco, Texas),  best known by her pen name Heloise, is an American writer, author, and speaker specializing in lifestyle hints, including consumer issues, pets, travel, food, home improvement, and health. Heloise's father was in the Air Force,  and like many military brats she moved frequently. Heloise's mother, Heloise Bowles (May 4, 1919–December 28, 1977), born in Fort Worth, Texas, started a newspaper column in the Honolulu Advertiser called "Readers Exchange" in February 1959, later changed to "Hints from Heloise" when King Features Syndicate picked up the column and started syndicating it nationwide. Within just a few years, the column appeared in over 600 newspapers worldwide. Fort Worth is the 15th-largest city in the United States and the fifth-largest city in the state of Texas. It is the county seat of Tarrant County, covering nearly 350 square miles (910 km2) into four other counties: Denton, Johnson, Parker and Wise. According to the 2017 census estimates, Fort Worth's population is 874,168. The city is the second-largest in the Dallas–Fort Worth–Arlington metropolitan area, which is the 4th most populous metropolitan area in the United States. King Features Syndicate, Inc. is a print syndication company owned by Hearst Communications that distributes about 150 comic strips, newspaper columns, editorial cartoons, puzzles, and games to nearly 5,000 newspapers worldwide. King Features Syndicate is a unit of Hearst Holdings, Inc., which combines the Hearst Corporation's cable-network partnerships, television programming and distribution activities, and syndication companies. King Features' affiliate syndicates are North America Syndicate and Cowles Syndicate. Each week, Reed Brennan Media Associates, a unit of Hearst, edits and distributes more than 200 features for King Features. Good Housekeeping is a women's magazine owned by the Hearst Corporation, featuring articles about women's interests, product testing by The Good Housekeeping Institute, recipes, diet, and health, as well as literary articles. It is well known for the "Good Housekeeping Seal", popularly known as the "Good Housekeeping Seal of Approval". Aquarius is a home computer designed by Radofin and released by Mattel in 1983. It features a Zilog Z80 microprocessor, a rubber chiclet keyboard, 4K of RAM, and a subset of Microsoft BASIC in ROM. It connects to a television set for audio and visual output, and uses a cassette tape recorder for secondary data storage. A limited number of peripherals, such as a 40-column thermal printer, a 4-color printer/plotter, and a 300 baud modem, were released for the unit. Heloise graduated from the Southwest Texas State University in San Marcos, Texas (now Texas State University) in 1974 with a double major in Business Administration and Mathematics,  and a teacher's certificate. She currently resides near San Antonio, Texas. San Marcos is a city in the U.S. state of Texas, within the Austin–Round Rock–San Marcos metropolitan area. It is on the Interstate 35 corridor between Austin and San Antonio and is the seat of Hays County. Its limits extend into Caldwell and Guadalupe counties, as well. Its population was 44,894 at the 2010 census and was an estimated 61,980 in 2016. Texas State University is a public research university located in San Marcos, Texas, United States. Established in 1899 as the Southwest Texas State Normal School, it opened in 1903 to 303 students. Since that time it has grown into the largest institution in the Texas State University System and the fifth-largest university in the state of Texas with an enrollment of over 38,000 students for the 2017 fall semester. It has ten colleges and about fifty schools and departments. 1 2 3 Michael Quintanilla (April 18, 2010). "Helpful snippets: Cutting-edge decisions can be rewarding". Amarillo Globe-News. Retrieved 2014-03-13. ↑ "ABOUT THE AUTHOR: Fact Sheet". Heloise.com. Retrieved 2014-03-13. ↑ Dorothy Copus Brush (July 20, 2010). "Random Thoughts: Dare to make a difference". Crossville Chronicle. Crossville, TN. Retrieved 2014-03-13. ↑ "Intellivision Classic Video Game System / 1983 Aquarius Catalog". www.intellivisionlives.com. Retrieved 8 March 2018. Mildred Augustine Wirt Benson was an American journalist and author of children's books. She wrote some of the earliest Nancy Drew mysteries and created the detective's adventurous personality. Benson wrote under the Stratemeyer Syndicate pen name, Carolyn Keene, from 1929 to 1947 and contributed to 23 of the first 30 Nancy Drew mysteries, which were bestsellers. Margo Howard is an American writer and former advice columnist. She is the only child of businessman/innovator Jules Lederer and Eppie Lederer, the niece of Pauline Phillips, and the cousin of Jeanne Phillips. Laura Catherine Schlessinger is an American talk radio host and author. Her radio program consists mainly of her responses to callers' requests for personal advice and has occasionally featured her short monologues on social and political topics. Her website says that her show "preaches, teaches, and nags about morals, values and ethics". Mary Tyler "Molly" Ivins was an American newspaper columnist, author, political commentator, and humorist. Born in California and raised in Texas, Ivins attended Smith College and the Columbia University Graduate School of Journalism. She began her journalism career at the Minneapolis Tribune where she became the first female police reporter at the paper. Ivins joined the Texas Observer in the early 1970s and later moved to The New York Times. She became a columnist for the Dallas Times Herald in the 1980s, and then the Fort Worth Star-Telegram after the Times Herald was sold and shuttered. The column was subsequently syndicated by Creators Syndicate and carried by hundreds of newspapers. A biography of Ivins, Molly Ivins: A Rebel Life, was co-written in 2010 by PEN-USA winning presidential biographer Bill Minutaglio and W. Michael Smith. Kimberly Ann "Kim" Komando is the host of a radio show about consumer technology. On her weekly call-in show, she provides advice about technology gadgets, websites, smartphone apps, and internet security. Connie Schultz is an American writer and journalist. Schultz is a nationally syndicated columnist for Creators Syndicate. She worked at The Cleveland Plain Dealer newspaper from 1993 to 2011. She won the 2005 Pulitzer Prize for Commentary for "her pungent columns that provided a voice for the underdog and underprivileged." She is married to Sherrod Brown, senior Democratic U.S. Senator for Ohio, and resigned from the paper to avoid a conflict of interest. She teaches journalism at Kent State University. Jeanne Phillips, also known as Abigail Van Buren, is an American advice columnist who has written for the advice column Dear Abby. She is the daughter of Pauline Esther "Popo" Phillips, who founded Dear Abby in 1956, and her husband, Morton Phillips. 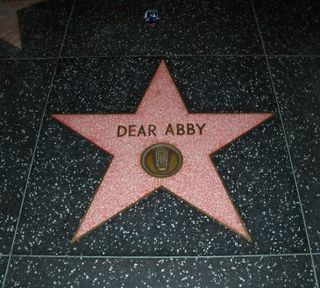 Dear Abby is an American advice column founded in 1956 by Pauline Phillips under the pen name "Abigail Van Buren" and carried on today by her daughter, Jeanne Phillips, who now owns the legal rights to the pen name. Monica "Dr. mOe" Frazier Anderson, D.D.S., D.B.A. is an American bestselling author, journalist, motivational speaker, podcaster, and Doctor of Dental Surgery. Cruse is a surname of English origin. Marilyn Beck was a syndicated Hollywood columnist and author. May Mann was a Hollywood columnist and freelance writer. She wrote a syndicated column about Hollywood gossip and wrote articles on celebrities for fan magazines. Her "Going Hollywood" column was syndicated to 400 newspapers, and contributed to movie magazines Movie Mirror, Silver Screen, Movie Teen, Screenland, and Photoplay. Her columns often featured photos of herself with the celebrity she profiled. She befriended several celebrities and wrote books about Elvis Presley, Clark Gable, and Jayne Mansfield. She was known as "Hollywood Date Girl" since she wrote about parties that she attended with Hollywood celebrities. Heloise Bowles Cruse was the original author of the popular syndicated newspaper column "Hints from Heloise." Elizabeth Winship (1921–2011) was a columnist who wrote the syndicated advice column "Ask Beth." DeLisa “Lisa” Fritsch is an American author, public speaker, entrepreneur and community activist. She was runner up in the 2014 Republican Primary against Greg Abbott for Governor of Texas. She has written three books on politics and social change, one of which, Obama Tea Parties and God, was a local bestseller. 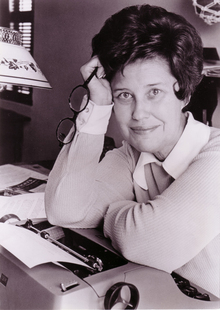 Adeline Helen Daley was one of the first female sportswriters, covering baseball for the San Francisco Call-Bulletin. She later went on to become a nationally syndicated humor columnist for the San Francisco Chronicle for two decades. Her writing was praised as mixing "gentle humor with sly wit and an occasional sharp needle."